Movie Review - Jurassic World: Fallen Kingdom - Honk if you love justice! The first Jurassic Park is a classic. Plenty of tension, action, humor. When we have fond memories of this franchise, that’s the movie we’re all thinking of. As you move forward, they decline rapidly in quality. Most of the good feelings you have for The Lost World and Jurassic Park 3 are due to Jeff Goldblum and Sam Neill. The hugeness of Jurassic World’s success came as a bit of a shock, so despite the actual plot of THAT movie being pretty dumb there was no way a franchise-hungry production company wasn’t going to follow it up. Which means we get stuck with Jurassic World: Fallen Kingdom. Spoilers from here on out. That brings us to Jurassic World: Fallen Kingdom. After yet another park fails catastrophically, we find Claire…wait, nobody’s in jail? I know Masrani was killed, but were there NO CONSEQUENCES? Hundreds of rich white people got trampled and eaten! We’re expected to believe that Claire somehow cares deeply for dinosaurs? Before this, she was a business woman, and seemed to regard the dinosaurs as attractions, no different than amusement park rides. Then they very nearly eat her AND her nephews. Yeah, not their fault but where in there did she become an animal rights advocate? Oy. A previously-unmentioned volcano threatens to destroy the dinos on the island, and Claire wants to rescue them. Luckily for her, Hammond had a previously-unmentioned partner in the past who wants to save them too! Except they double-cross Claire (and Owen, who wants to go back and save Blue, the best character in these two movies) and take the dinosaurs to sell to what amounts to a bunch of supervillains. Seriously, Arnim Zola from the Captain America movies is there and everything. 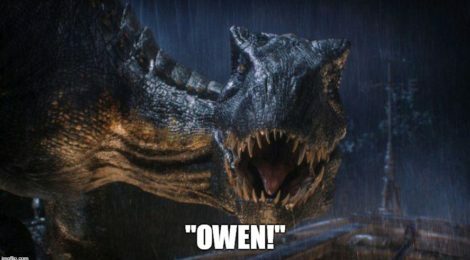 Owen and Claire (with the required cute kid sidekick) manage to thwart the bad guy (Eli Mills, who killed Hammond’s partner earlier in the movie and looks like an uncanny valley copy of Ryan Reynolds) but in doing so, they release a few dozen dinosaurs into the wild. Of the United States. That right there has the potential to be a complete ecological disaster. It’s not clear if there are breeding pairs, but we’ve already seen nature “find a way” previously. You only have to look at Australia to see what could happen. Maybe the final movie in the Jurassic World trilogy will deal with that? Not sure if that would have enough big dinosaur fighting action for the studio though. It’s not all bad, as Chris Pratt is still charming, and the cinematography is fine. They show too much of the dinosaurs though, which has been an issue since the The Lost World. Bryce Dallas Howard no longer wears high heels in the jungle. Jeff Goldblum’s extended cameo, most of which you saw or heard in the trailers, is great, and is well-used. If you can see it cheap (Moviepass, matinee) it would be fine. If you need to refresh your memory on Jurassic World first, rent it at Amazon.